This shoulder dusting 'do is dressed in subtle waves through the back and sides to give the over-all hairstyle plenty of bounce and movement. The shape of this 'do is perfect to complement an angular face and is great for any occasion. Product is needed to tame fly-away hair and regular trims will help maintain a healthy look and feel. Zuri Hall looks lovely here in a shoulder length wavy bob that is perfect for both day and night. Zuri has an oblong face shape with a stronger jawline so 'dos with texture and wave work well to soften her bolder features. 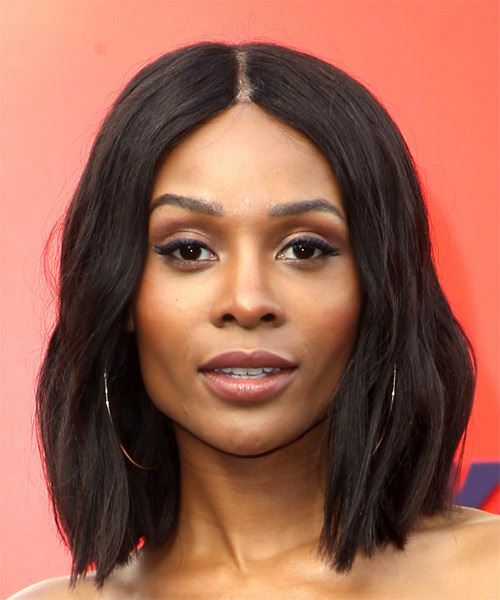 Zuri's blunt cut locks are waved with subtle, flat waves which gives her hair extra body and bounce while her center-parted grown out fringe highlights her eyes and high cheekbones. This 'do is a simple but timeless hairstyle that is ideal for her face shape as it balances out her features and gives her face a more balanced shape. Zuri has a medium dark skin tone with dark eyes, which makes her best suited to jet black hues as well as dark brunette tones. Although Zuri has experimented with various brunette, black and red shades in the past, she is known for her gorgeous black-brown hair tone, which suits her skin tone and eye color very well. This rich espresso shade brings out the glow in her complexion and the sparkle in her eyes. Zuri Hall is an American television personality. She is the co-anchor of E! News, and the former host of MTV's after-shows and reunions for the popular reality game show The Challenge.